When sports gambling became something individual states were allowed to deal with and the federal ban was lifted, there was a lot of talk about how it would impact horse racing. While that remains to be seen — and may vary from state to state — in New Jersey, where sports wagering has already been implemented, we’ve seen some interesting crossover. 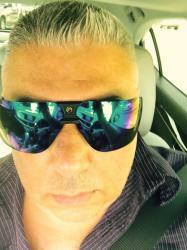 I won’t opine on the long-term effects this may or may not have, but, as a gambling man by nature, I do recognize unique and savvy wagering opportunities. I have never been a fan of the advance wagers on horse racing. There is almost always enough value to be had on the Kentucky Derby and the Breeders’ Cup on the day(s) they take place to satisfy any bettor — and those are the days that most advance wagers are centered on. Proposition betting is another story and I have often said Amarillo Slim don’t have a thing on me when it comes to that. On July 29, Monmouth Park had its big day and event (the Haskell Invitational). While Justify being retired didn’t help the track’s cause — and we all know track management wanted him there — it was also the first time the race would be run with a sports-betting parlor on the grounds. Some proposition wagers were also offered on the big race — one of which caught the eye and will prompt me to watch for these in the future. I am not a fan of bridge-jumping. I don’t think I have ever made a show bet in my life. I don’t know, I just believe you try to pick the winner and bet to win. It is a kill-shot philosophy, as, generally speaking, I don’t box or reverse exacta wagers. I think when you are right you make it count and you minimize losing wagers. Cash less and win more. You either understand and get it, or you don’t understand and don’t get it. 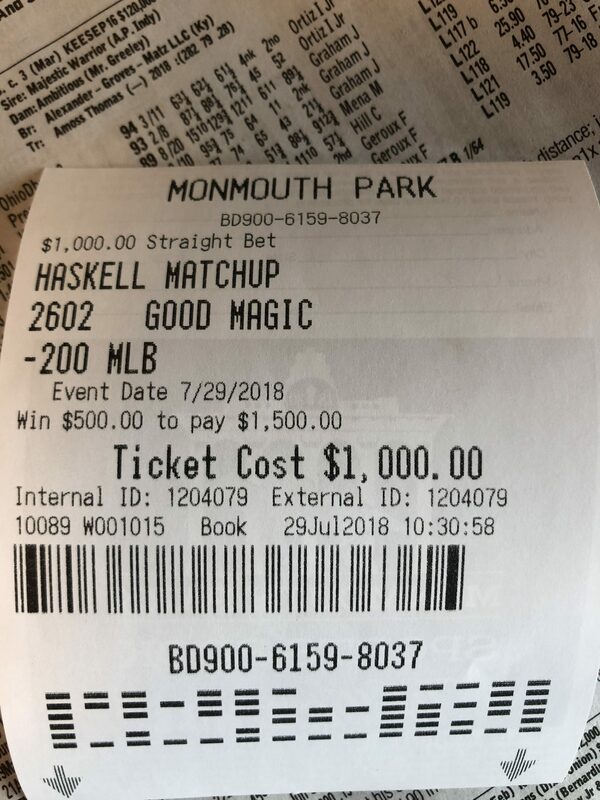 On Haskell Day it was no secret Good Magic was the horse to beat and would go to post favored. He also looked like a legitimate favorite, and it was tough to find any chink in his armor against his Haskell rivals. I expected him to go off around even money or maybe 4-5, but not 1-2, which is where he wound up. His jockey, Jose Ortiz, was hot that day, as was his trainer, Chad Brown, and that probably reduced his odds a tad. 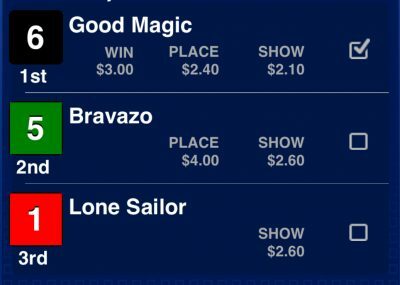 The sports book offered a proposition wager: bet $100 to win $50 that Good Magic beats Bravazo. This is essentially getting 1-2 — the same win odds Good magic closed at — and just needing him to beat one horse, Bravazo. He could finish fourth and, as long as Bravazo finished fifth or worse, you are a winner. In other words, if anyone on track bet Good magic to win, they should probably find another pastime. This may not be their game. I have often wondered who is betting 1-2 shots to win anyway, but obviously people are, as the odds do not lie in pari-mutual wagering. Proposition (“prop”) bet offered by Monmouth Park on Good Magic vs. Bravazo in the Haskell Invitational (photo by Jonathan Stettin). If you take a look at the ticket in the photograph you will plainly see Good Magic at 1-2 to beat only Bravazo. You will also see a photograph of the win price of $3.00. The ticket is that of a friend who was there and, although it does not state the name Bravazo, he was the one involved in the prop bet. Results of the Haskell Invitational (photo by Jonathan Stettin). Proposition wagering is pretty much you against the house and, unlike horse racing (at least in the US), the odds are fixed and you know what they are. Monmouth Park had no limit on this proposition wager and advertised it as such. I found that interesting. I would love to see if the track turned away a wager on that prop of, say, $200K to make $100K. What about a cool $1 million to take down $500K without breaking a sweat? Every casino and even racetrack, for that matter, reserves the right to refuse any wager from anyone at any time. 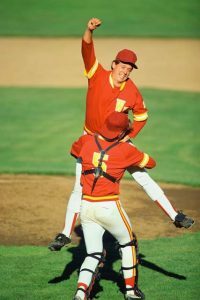 I have heard of cases where Monmouth turned away bridge-jumping show wagers. One thing we now know is it pays to pay attention to proposition wagers, especially as they are phased in and integrated into horse racing. This is new territory for racetracks and with that comes new opportunities. I love the Betfair concept of being able to bet horses to lose, as opposed to win, and laying your own odds out there for whatever takers come along. If you have the resources, you can literally have a game-changer in one race if you are not afraid to go all-in. In life, business and in racing you can’t be afraid to go all-in. You just have to be right when you do. The proposition concept is equally intriguing. Even if you do not see this as a kill-shot opportunity for a major score, and I get that, as nobody likes to lay odds in a horse race, you simply can’t argue that 1-2 to beat one horse is better than 1-2 to beat the whole field. I’m sure as this progresses these blatant opportunities with become harder to find. But if you are deep in the black by then, what’s the difference? Who’s Your ‘Daisy’ in the 2018 Kentucky Derby?